Every year our staff vote for their favourite books, albums, films and TV shows of the past 12 months. Here are our top 10 picture books of the year, voted for by Readings' staff, and displayed in no particular order. Love is anybody and everybody. It is families comprising all manner of configurations and ethnicities. It is helping out, pitching in and sharing around. It is jumping in puddles together, baking a cake or chasing pretend monsters. The rambunctious, colourful joy of life bursts from every dazzling page of this inclusive book. Ages 0–5. 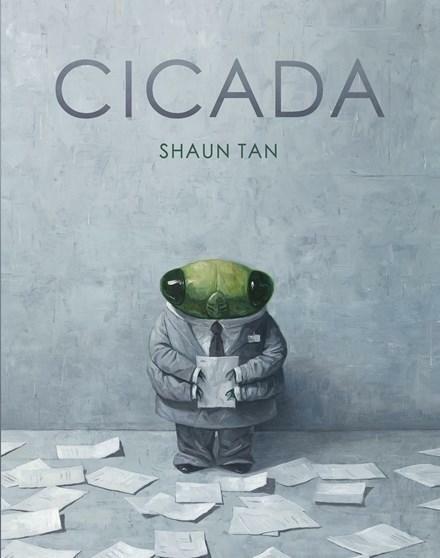 There is always an atmosphere of sanguine melancholy pervading Shaun Tan’s books and Cicada is no exception. This cicada is a creature who embodies the entrapment of a cruel society. Unforgettably sad and uplifting, you are in the hands of a master storyteller who tells so little but alludes to so much. Ages 5+. Square’s friend Circle thinks Square is a sculptor of genius and urges him to make a likeness of her out of stone. Square is stumped; dismay sets in, rain falls and things get messy. Happenstance and illusion save the day in this deceptively simple story about art and expectations. Ages 2+. After a colourful, rollicking, joyful, rhyming read there is only one word for this book: wise. Good scores in a test are great but the importance of celebrating the creative, collaborative and just plain quirky things that make us emotionally intelligent and well-rounded could not have been better portrayed. Ages 3+. Harriet is adorably exuberant about dress-up costumes. While shopping for party hats, dressed as a penguin, she gets carried away by a flock of real penguins. Harriet needs to get back in time for her party; luckily she is resourceful and intrepid, facing each challenge with strong self-belief. Kids will love this funny, well-paced book. Ages 2+. This is a picture book to make your heart sing. Julian, who loves the water, sees three fabulous mermaids on their way to a parade. Oh, how he yearns to be one too! Julian is adorable but check out Nana; a mighty, loving, no-nonsense scene-stealer. The storyline seems simple, but brilliantly conveys so much. Ages 2+. In this salute to nature and the freedom to explore, a secret, snug world is found in gigantic forests and beside sparkling rivers. There is not an adult in sight as treehouses of all shapes, sizes and designs are assembled and enjoyed in perfectly married poetic text and cheeky illustrations. Unanimously loved! Ages 3+. I have loved every magical picture book the Fan brothers have created. A young boy honours his grandfather by building a boat and an enchanting voyage begins as he seeks out the stories his grandfather told. Wonder and yearning mingle in this stunning evocation of intergenerational love. Ages 3+. Lateral thinking and resourcefulness are quietly championed in this charming story. Go Go loses a much cherished new shoe but then makes a friend who likes the look of a girl with mismatched shoes – unlike some of the uncharitable girls at school. Jane Godwin and Anna Walker understand childhood, and this endearing story sparkles. Ages 2+. This is a life-affirming and lyrical exploration of colour and the natural world. Illustrated with fluid swathes of colours and ebullient movement, the text, by contrast, offers the meditative and lulling pondering of a young girl who wonders at and revels in the magnificence and mystery of our world. Ages 3+.